Today I’ll be sharing my skincare favorites of 2017. I meant to get this post up earlier, however January has proven to be an extremely busy month getting back into the work routine. Better late than never right? On the other hand, it has also been an incredible month attending beauty events and learning about new launches and I look forward to sharing more details with you soon on the blog. 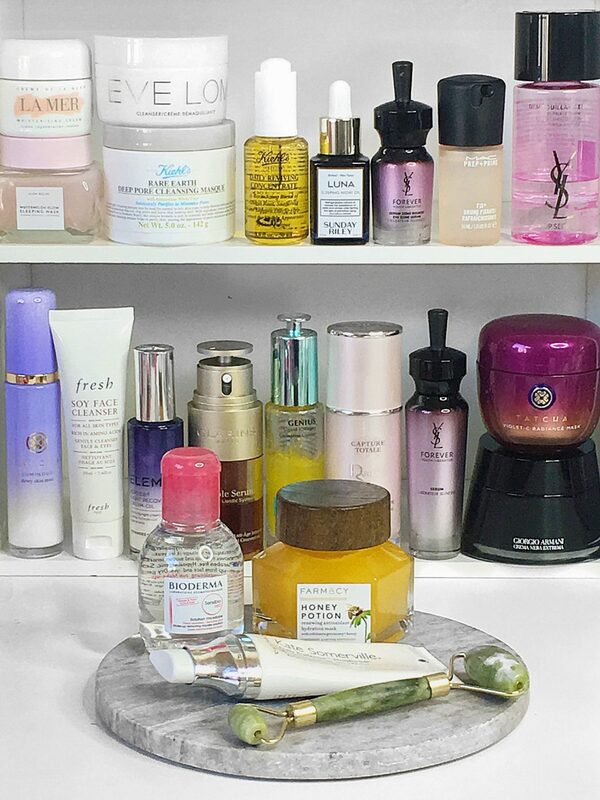 These are all products that have either been in my skincare routine for a few years now or products that I was introduced to in 2017 that I fell in love with. For reference, my skin type is rather normal. Occasionally, I will experience some dryness and the displeasure of a breakout or two. Fortunately, my skin is rather blemish free and I can attribute this to the years that I’ve spent caring for my skin. Fresh Soy Cleanser – I use this cleanser day and night. I have tried other cleansers but I keep going back to this one and for good reason. It gently cleanses my skin and does not strip it dry. I can even use it gently around the eye area without any irritation. According the the product description, it contains soy ingredients and is rich in amino acids that support moisture retention. It also contains rosewater to balance and tone the skin. My introduction to this line started years ago with with the inclusion of this product in the limited edition Cherry Blossom Clarisonic Plus Set that I purchased from Sephora. The Clarisonic cleanses your skin 6x more effectively than washing with your hands manually. Better cleansing=better absorption of skincare products. I only use the Clarisonic in the evenings to give my skin a deep clean and I don’t use it every single night. There are days when I’m tired and I will skip this process for a simpler wash so I can get to bed. YSL Top Secrets Expert Makeup Remover– This gently removes all my eye makeup, even water proof mascara. I soak my cotton pad and let it sit for 10 seconds before gently swiping it all off. It works like a charm! You can find it at Nordstrom. Bioderma Sensibio H2o Micellar Water– This is one of my holy grail products that I have repurchased several times over. It removes traces of anything that I might have left behind. I have also used this to wipe away my eye makeup and heavy lip stains, and it works amazingly well! I use my favorite cotton pads from Shiseido to gently wipe away any traces of dirt, grime and makeup left behind. Eve Lom Cleanser*-This cleanser, available at Sephora is quite a skin treat. It is something that reminds me of a spa treatment as it includes a Muslin Cloth to help with skin exfoliation. This is something that I have been incorporating into my skincare routine since last year. It is not a one-and-done type of cleanser. This is the type of cleanser you use when you have extra time to treat yourself at the end of a long day. Clove oil targets blemishes and encourages clear skin, while eucalyptus oil combats toxins and helps to tone the skin. It also includes Egyptian chamomile oil to soften the skin and cocoa butter to condition and nourish. In short, you get a host of beneficial ingredients to treat your skin while the aromatherapeutic qualities leaves you feeling like you’ve just received a spa treatment at home. It exfoliates, brightens, and tones. 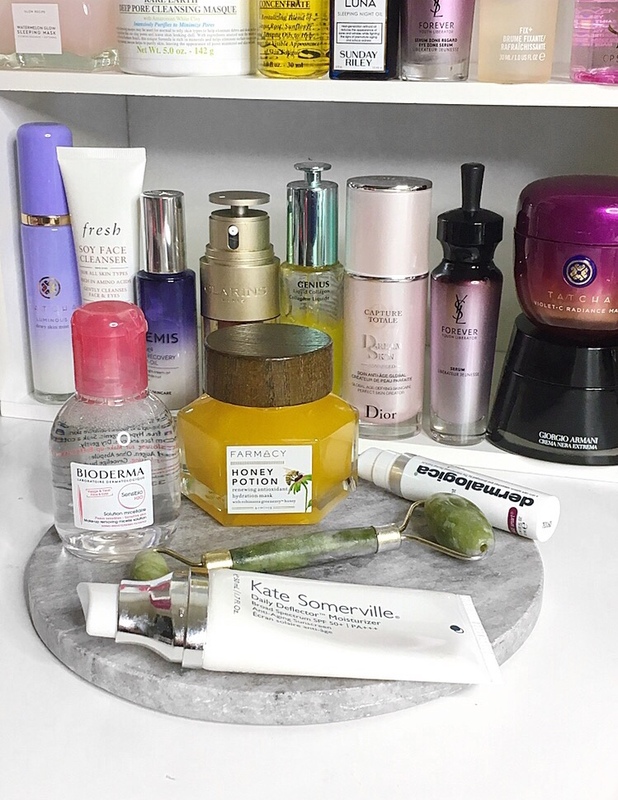 Now that I am in my thirties, I constantly search for look for products that will help to not only prevent premature aging, but to keep my skin feeling hydrated and nourished. In my quest to find the most effective items for my skin type, this year I stuck to some staples, but also tried out new products I had the opportunity to test out. Sunday Riley Luna Sleeping Night Oil-This product is a skincare staple. It’s a retinol oil that works overnight to help address all signs of aging. It helps to even out my skin tone, and brings back life to my skin. My dull skin becomes more radiant when I wake up in the morning. Clarins Double Serum*– It contains powerful plant extracts with antioxidant & anti-inflammatory properties and has a unique innovative dual chamber suspension system which allows the two phases to mix together upon application. I was really wowed by the serum. I noticed the difference in my skin texture and appearance after using it for a few days.This is a product that was kindly sent for review and once it’s all gone, I would purchase it for myself. Algenist Genius Liquid Collagen*-This is a a vegan, collagen based treatment that I wear in the day before my moisturizer. The formula contains 13,000 microalgae oil beads and omegas 3, 6, and 9, and a natural source of vitamin E. These ingredients have been truly wonderful for my skin. It makes my skin fill more plump and soft. You can find it at Sephora. YSL Forever Youth Liberator Serum*-I received this product as gratis about a year ago while attending training for L’oreal Designer Brands. This serum is formulated with the highest concentration of Glycanactif™, which is specially formulated to help restore the appearance of skin’s youthfulness. It has been on my skincare rotation ever since. The serum absorbs so nicely into my skin. I love how smooth and soft my skin immediately feels. It helps to give back a youthful vitality to my skin that I love. YSL Forever Youth Liberator Eye Zone Serum– This serum helps to address my delicate under eye area. The eyes are the first thing that can give your age away, so I’ve been working very hard to minimize fine lines, crow’s feet and puffiness. I don’t have any crow’s feet, but dark circles and under eye bags are problematic for me. This serum immediately plumps my under eye are and leaves it smooth and hydrated. I even put the serum along my upper lips, laugh lines and cupid’s bow to smooth the surface. I highly recommended you give it a try. It has won numerous awards, and for good reason. Elemis Peptide 4 Night Recovery Cream Oil*– I am on my second bottle of this hybrid cream oil. It delivers amazing hydration and I love the way it smells. The cream helps to support the natural process of skin’s circadian rhythms, which boosts nighttime skin renewal. Kiehl’s Daily Reviving Concentrate– I was first introduced to this product by a makeup artist that swears by it. The Daily Reviving Concentrate helps the skin to defend against daily aggressors and provides antioxidant protection–yes please! Dermalogica Nightly Lip Treatment*– I am the type of person that suffers from dry chapped lips and this treatment oil is amazing. It leaves my lips smooth, plump and moisturized. Kate Somerville Daily Deflector Moisturizer SPF 50+– I use SPF on a daily basis since I live in mostly sunny California. I purchased this product earlier this year and think it’s definitely a keeper. It absorbs nicely, doesn’t leave any white cast and with an SPF grade of 50+ I feel assured that I am protecting my skin from the sun’s damaging rays. Giorgio Armani Crema Nera Extrema– The heart of this luxurious cream is the Reviscentalis plant, which is a revival plant that has regenerative properties. This cream feels so luxurious on the skin and I’ve been using it when my skin needs a little extra TLC, when I need to bring my skin ‘back to life.’ It is a thicker cream so I prefer to only use it at night. Now that I am in my thirties, investing in skincare is a huge priority. My skin not only feels nourished, it also feels soft and supple. This moisturizer delivers hydration, and so much more. This moisturizing cream was something that piqued my curiosity when it was featured in several magazines a few years ago. It seemed like every celebrity sang praises about this cream. I tried several samples of this product before I committed to purchasing it, since it is quite pricey. It has been worth the investment! I take a small scoop of the product, warm it up between my palms, and gently pat it all over as the last step before going to bed. Upon waking up, my skin feels nourished, revitalized and smooth. My skin feels replenished and I have really come to love using this product. Dior Capture Totale Dreamskin Advanced Skin Perfector*-It helps to correct and even my skin tone when worn alone or under foundation, immediately minimizing my red spots and helping to blur imperfections. It feels like an invisible veil and I am so happy to have it as part of my skincare routine. It’s good for all skin types and ages. 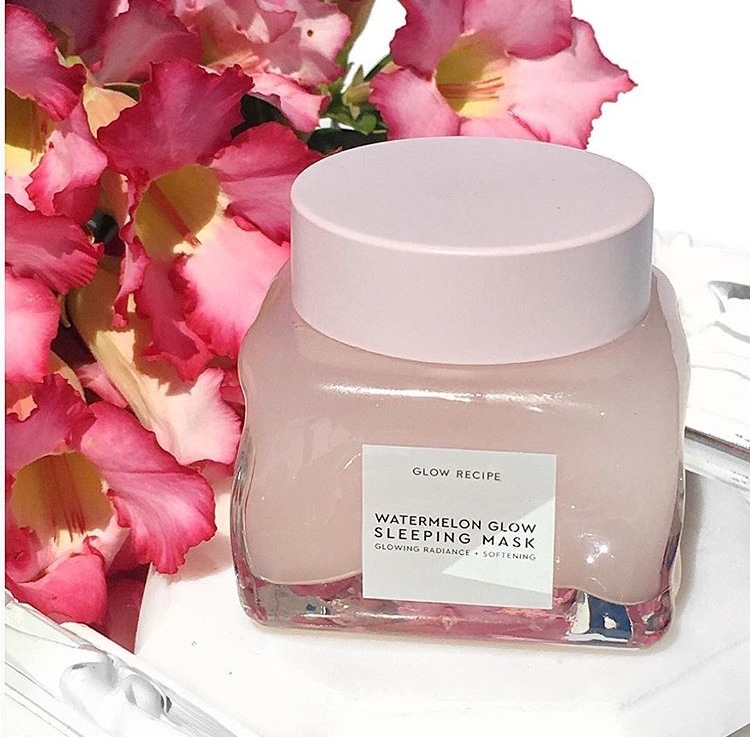 Glow Recipe Watermelon Glow Sleeping Mask– This mask feels incredible on my skin and smells so delightful. I use it overnight at least once a week. It has a bouncy, breathable texture that is oil-free, lightweight and is formulated with watermelon extract to soothe. It deeply hydrates with hyaluronic acid, and consists of gentle AHAs that work while you sleep. I’m on my second jar! 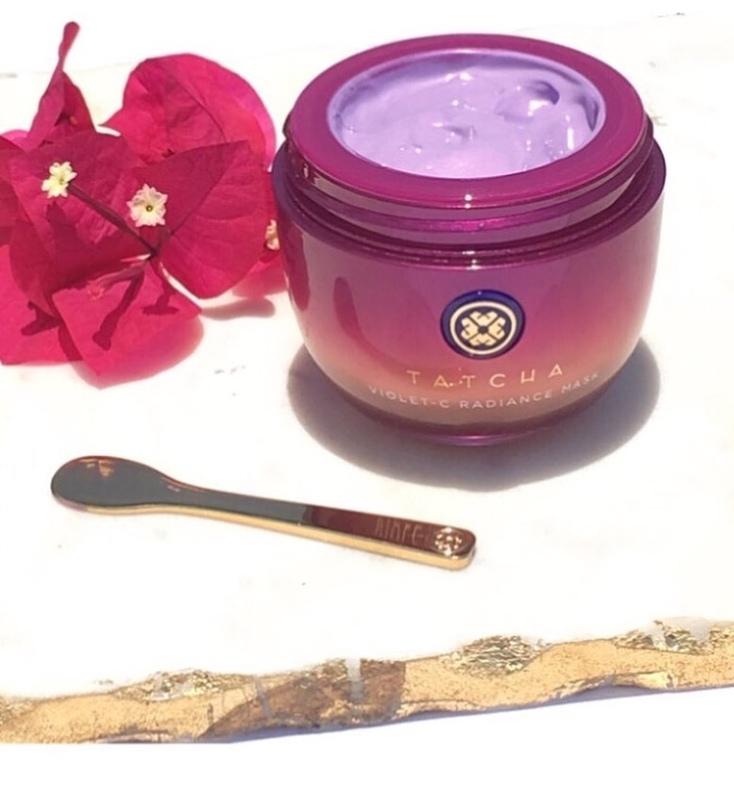 Tatcha Violet C Radiance Mask– Tatcha can do no wrong in my book. I just love the way this mask immediately brightens my skin and leaves it feeling smooth, soft and radiant. Kiehl’s Rare Earth Deep Pore Cleansing Mask– Occasionally my skin will break out and I need something to give it a deep clean and this mask is what I often find myself turning to. It helps to eliminate debris and dead surface skin-cell accumulation and my skin always feels brand new after wards. Farmacy Honey Potion Renewing Antioxidant Hydration Mask*-This mask feels so wonderful on my skin. It gives a nice warming sensation that is so pleasant after a long, tiring day. My skin feels immediately hydrated, smooth and glowing. It’s truly amazing. Tatcha Luminous Dewy Skin Mist– This fine mist comes in beautiful luxe purple packaging and does not contain any alcohol which can be drying for skin. It gives the most beautiful, hydrating, lit from within glow that does not feel the least bit sticky or greasy. It can be used before or after foundation; with minimal makeup or a full face, or on bare skin alone. I have tried it all three ways and my preference is to to use it for a dose of hydration during the day when I need it most. My makeup still stays firmly in place and it provides such a lovely glow. 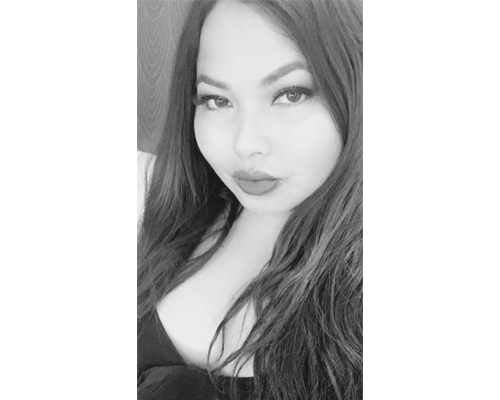 MAC Prep + Prime Fix + – This product has been a staple in my makeup routine. I use it to intensify my shadows & highlighter, and to set & refresh my makeup. It’s a must have M•A•C product that everyone should try. It’s now available in four permanent scents of Rose, Lavender, Coconut, & the original. 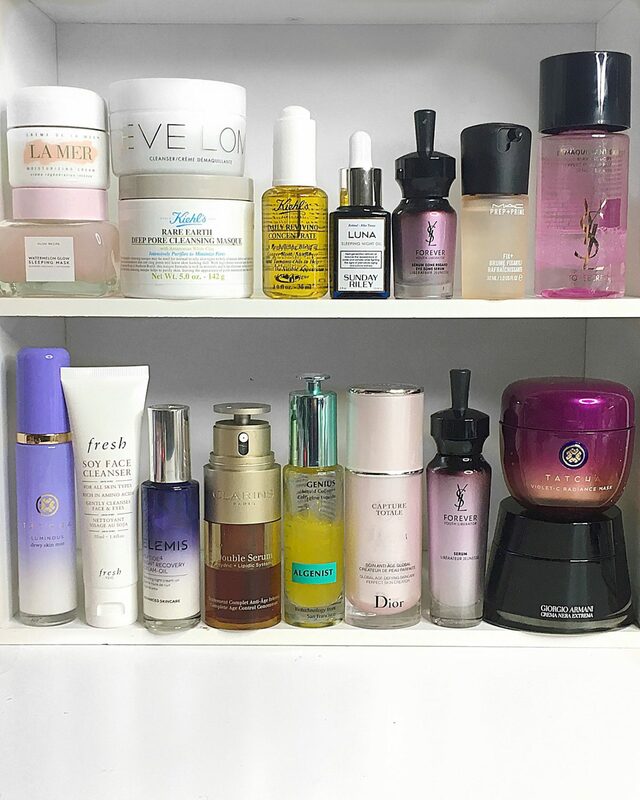 What were some of your skincare favorites and what are some of your recommendations? *Gifted. All opinions are honest and expressly my own. Some links are affiliated, read my full disclosure here.